This is a real winner. The flavour combinations along with the range of textures will blow you and your friends away. Conveniently the pastry and mushrooms can be prepped up to 24 hours in advance. Start by unrolling the pastry onto a lined large baking sheet, cut into 3 equal pieces. Cover with a second piece of parchment paper and a second baking sheet, bake in a preheated oven for 22-28 minutes until golden. Transfer to cool completely on a wire rack. Heat a little oil in a pan and cook the onions until translucent. Slice the mushrooms thinly, add half of the mushrooms into the pan with the onions and cook until tender and well cooked, remove to a plate. Add a little more oil and grate in the garlic, add the remaining mushrooms and cook until soft, now add the sherry if using and reduce down. Set to one side to come to room temperature. Place one sheet of the pastry onto a serving plate, gently whip the Philadelphia and spread a third onto the sheet of pastry, cover with half of the mushrooms and a third of the basil leaves, add the second sheet of pastry and repeat the process. Cover with the final sheet, use the last third of Philadelphia to cover. 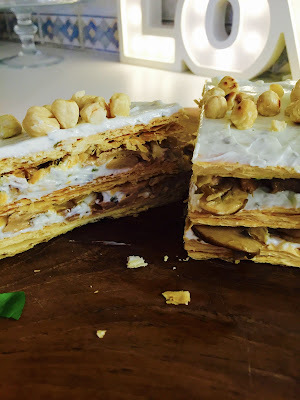 Toast the hazelnuts in a dry pan until slightly browned, crush slightly with a rolling pin and sprinkle over the mille feuille, finish with the remaining basil leaves.